Group tours may be arranged for other dates. A donation is always appreciated to further the restoration. 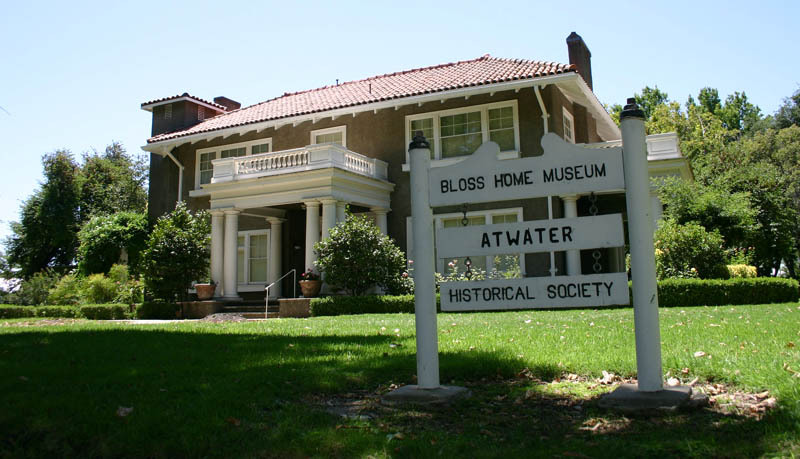 Other sites of interest are Bloss Memorial Library, built in 1925 in memory of George Thompson Bloss and now housing the Atwater Chamber of Commerce, Bloss Park, and the Atwater Women’s Club which was built in 1926 on land donated by Edna Thompson Bloss. The house was built in 1914, at the cost of $11,954, by George Stone Bloss (also known as George Bloss Jr.) and his wife Christine. The architect of the house was William (Bill) Bedesen, who passed away in 1986 having attained the age of 102. The square footage, counting enclosed porches (service porch & sleeping porch) , but not including the open porches, is 4080 square feet. George Jr. was a grand nephew to John Mitchell and originally arrived in this area from Connecticut in 1884, at the age of 10 years, with his sister and parents. George Jr. was to become the first mayor of Atwater, when the city was incorporated in 1922. John Mitchell, whose picture is on the wall of the first landing, arrived in this area in the early 1850’s , buying up land at $1.00 an acre in greenbacks (paper money) or 75 cents an acre in gold. He owned several thousand acres in the valley, from Keyes (South of Modesto) to Herndon (just North of Fresno). 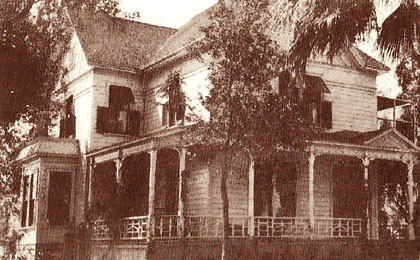 When Mitchell passed away much of his estate went into setting up the Fin de Sicle Investment Company, operated by three prominent Merced and Stanislaus County families, the Bloss’s, Geer’s, and Crane’s, who were all related to Mitchell by marriage to Mitchell’s nieces, who were heirs to the estate. It was this company that helped to build the communities of Atwater, Merced, and Turlock. In 1957, when George Jr. originally wrote his will, he left the house to the City of Atwater, hoping that it would be used as a city hall, (city hall at that time was located in the basement of the Bloss Library building located at the corner of Cedar and Third Streets). The library had been built by George Bloss Sr. as a memorial to his Grandson. There was no doubt that George Jr. felt that the house would provide suitable working space for the city staff and be used and enjoyed by the entire community as city hall. After his death in 1963, his wife Christine continued to reside in the home until her death in 1971, at which time the house became city property. Christine Bloss left the bulk of her estate in trust to accomplish these scholarships. 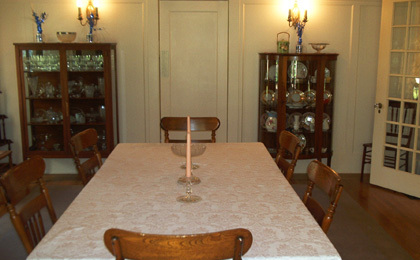 The original furniture in the house, at Mrs. Bloss’s death, was willed to her godchild, and namesake, Christine Meany Ward. 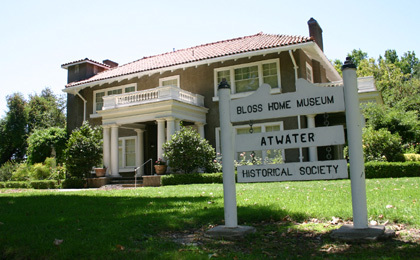 Mrs. Ward did return some of the Bloss possessions to the Historical Society for preservation and maintenance once the Society was permitted to occupy the home by the City of Atwater. In 1974, on George’s 100th birthday, the Atwater Historical Society dedicated the monument outside the home. This monument was designed and built by Bruce Rigan with the help of Greg Olzack, Charles Hendricks, and Charles Shaw. The State of California and Merced County had accepted the home to be listed by the State Historical Landmarks Division in 1974. In 1981, the house was placed on the National Register of Historic Places. The society was successful in soliciting donations from the community to begin the initial restoration and even today this is ongoing. It is hoped that the house can be restored to a home museum and kept for the area and future generations. 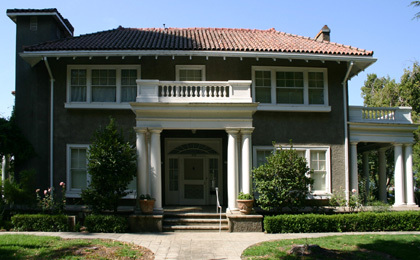 The living room and sunroom, until 1995, were used as offices (first by the Atwater Chamber of Commerce and then by the city Redevelopment Agency). Both rooms have hardwood floors and consist of 800 square feet. The porch on the Second Street side of the home was screened in until a few years ago and was originally adorned with large cement planters. 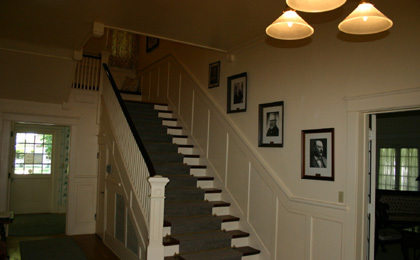 These two rooms were completely restored in the spring of 2001. During the day, while he was at home, he spent much of his time in the office discussing business and local situations of the community with other community leaders. 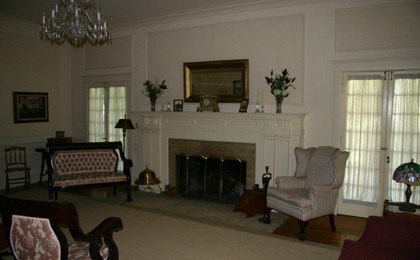 The living room area has a large fireplace and two sets of French doors that exit onto the Second Street porch. The dining room, directly across the hall, is just short of 360 square feet and also has a large fireplace. It originally had a French door that exited onto the First Street veranda, but this area was later utilized to form the tower for the elevator that was installed in the home. The elevator was added when Christine’s Mother (Mrs. Thompson) came to stay with the family. She occupied the bedroom directly above the dining room and this helped her negotiate the upstairs and downstairs without having to use the extensive staircase in the house. In later years, George Jr. was able to utilize this elevator as he had an equilibrium problem due to a physical disability. Passing through the dining room into the butler’s pantry you will see a door which leads to the servant’s quarter via a steep stairway. The cupboards in the pantry have built-in storage on top of them and a separate sink for doing the good dishes. Passing through the pantry into the kitchen you will note that the kitchen was only updated once (possibly during the late 40’s or early 50’s). Story has it that after World War II, a national refrigeration company had a contest to see who had the oldest icebox or refrigerator in various communities. In this area the Bloss family had the oldest one in use. The one in the kitchen at this time is not the original appliance, but identical to it. (The original refrigerator is now in the butler’s pantry). 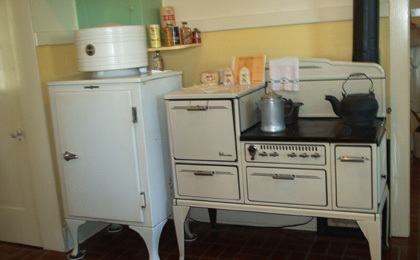 The stove is also similar and may have been original to the house since Mr. & Mrs. Joe Avelar donated it, to the society. Typist Note: (This stove was from the gardener’s house, the original stove is still in storage in LA.) Please note, the small stove (now on the back service porch) in the Butler’s pantry was one that was used by Mr. Avelar to heat with and cook on in the tank house, prior to his marriage. The tank house is located at the Southeast corner of the home and was used as a sort of apartment by Mr. Avelar, who was the gardener for the family for over thirty-five years. The gardener’s house was removed in the early 1980’s when redevelopment put the curve in the streets from 1st to Broadway). 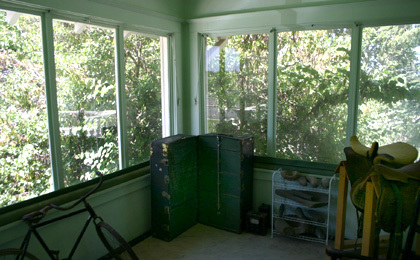 On the screened service porch there is a large cooler box which in years past was used to keep the meat cool. Meat was bought on a daily basis and kept in the cooler box until it was cooked. The large laundry sinks were in use by the Bloss family servants right up to the death of Christine in 1971. Small laundry that was done at home was washed in these sinks. The bulk of the laundry was sent out as there were never washers or dryers in the house. As you leave the kitchen area and go into the rear hall you will see a half bathroom to your left. There are four and a half baths in the home, one downstairs and four upstairs. Going down the hall toward the front door you will find the wide staircase to the second floor. On the first landing you will find a window seat (a good place for storing items) and the door to the servants quarters which are at the top of the steep staircase from the butler’s pantry. The room at the top and right on the second landing was the child’s room. The furniture in this room is original (used by the Bloss family). It had been given to the Avelar’s for their child and was used for their grandchildren. They presented the furniture to the historical society when the house was opened for tour. There is extensive closet space with built in cabinets as well as another cabinet with drawers below in this room. 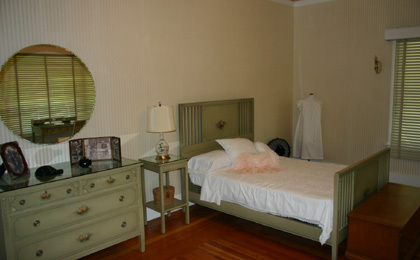 The guestroom was utilized by Mrs. Thompson and is presently being used as a display area for the Yosemite Valley Model Railroad Club. This was verified by Christine Meany Ward.) There is a complete rail system depicting the old railroad that ran between Merced and El Portal in the early days. It should be noted that while the elevator does enter this room it is not in use as it does not meet the safety requirements of the State and was closed off. A glass door was installed so that the elevator can be viewed downstairs in the dining room. Passing through the bathroom between the guest bedroom and the adjoining bedroom, which was occupied by Mrs. Bloss, you will see the old style fixtures still maintain their beauty. The porch roofs on the second floor have no access except through the windows and were not made for use but strictly decorative purposes. The bedroom occupied by Christine Bloss was enjoyed by her in later years. She would sit and admire the beautiful garden area across the street. This property was also owned by the Bloss family and is part of the landmark. George’s bedroom has some of his mementos on display. The adjoining bathroom has a unique shower, which George had modified in later years to hold six massage showerheads as well as the original one. It is said that he enjoyed sitting in this shower on a wooden stool and relaxing while the water sprayed from several different angles. This is the sleeping porch which was primarily used during the warmer months. They simply set up iron cots to sleep on. It was originally screened in, however to meet state safety standards the screen has been replaced with glass. In January 2006 the house had severe damage from water on the ceilings and walls of the second landing as well as the floor. This damage also affected the ceiling and walls of the first floor entry and the dining room. All has been restored with the exception of the dining room and the ceiling in the train room. Our good fortune was that during the restoration the original ceiling was replaced on the second floor over the staircase and landings and the light fixtures on the second floor ceiling were restored by Gloria Lawrence of Merced. The front, West & back porches have also been restored and the society continues to work on the outside & inside restoration of the home. September 22, 2008 Addendum: The ceilings in the train room, Mrs. Bloss’ bedroom, Mrs. Bloss’ entire Bathroom, and the ceiling in the dining room have now been re-plastered and painted. November 20, 2008: The dining room has been repainted as well as all the exterior wood trim and doors of the house.